In November, I did a gluten-free experiment, where I ate no wheat or gluten for 31 days. When I wrote about the results of the experiment, I said I was going to write a post the next week with all of my new favorite gluten-free (GF) foods. Well, I didn't get to it the next week, or the next. Since this is how I eat for the time being, it's not an experiment anymore, so writing this post has become somewhat of a daunting task. How do I write a post about all the things I eat? That's why I haven't written it until now. (I'm a bit of a procrastinator when it comes to large tasks.) I decided that I (obviously) cannot compile an exhaustive list of all the foods I love that are gluten-free. What I can do is highlight a few brands of the best pre-prepared foods that I tried, tell you what didn't work, and share a bunch of my recipes all in one place. I've finally completed it, so here is the first installment of a three-part series on my favorite gluten-free foods. First up: breakfast and lunch. (Next week you can expect to read about dinner at home, the following week will discuss eating out, and the final week will cover desserts and snack foods.) If you're feeling impatient in the meantime, here are all of my gluten-free recipes, many of which I will be highlighting over the next few weeks. Let's get started! I usually have eggs for breakfast, because I feel best when I start my day off with a good dose of protein. Before the experiment, I often made an egg-based breakfast burrito to eat in the mornings, because it's easy to eat with one hand while taking care of a wiggly baby. Several days during the experiment, I made my burrito with a brown rice tortilla. I found the rice tortilla to be easier to work with if I microwaved it between two damp paper towels before trying to roll it up. I liked the rice tortillas well enough, but it was more work than a flour tortilla. I found that after a couple weeks I didn't miss the bread portion of my breakfast. I gave up on the rice tortillas altogether, and now I eat my eggs with a fork. I also often have a breakfast meat in the mornings, usually bacon or chicken sausage. Check the labels on sausages, because sometimes they sneak a little wheat in there (why, I have no idea). Steel-cut oatmeal is another one of my favorite GF foods. It is a little time-consuming to prepare—compared to, say, eggs—but it's totally worth it. If you don't like the texture of oatmeal made with rolled oats (the flat kind) then try steel-cut. I much prefer it to rolled oats in the texture department. A tip for preparation: add a little oil or butter to the cooking water, it will help it not to turn out quite so sticky. I prefer to eat cold cereal for a snack, but since most people have it for breakfast, I'll talk about it now. I tried several different specially-made GF granolas, and I didn't like any of them. I want to try making my own, since it can't be too awfully difficult, and will be much less expensive than buying it pre-made. I do like Rice Chex and Corn Chex (with a slight preference for the rice version) which are both gluten-free. If you're into something a little more fancy, I'd like to recommend the Gluten-Free Breakfast Casserole I made for us to eat during our Christmas celebration. I really enjoy preparing and eating casseroles, since it's your whole meal in one dish. This particular casserole was a big hit. The popular opinion was that it was the best breakfast casserole I've ever made—far better than the version with wheat in it. That's good enough for me! Seems like I'll definitely need to make this again soon...and for many years to come. One of my main concerns with eliminating gluten from my diet for the experiment was that I was relying heavily on store-bought noodle soups (like Ramen noodles) to eat for lunch. I really needed to find something that I could make quickly when Daniel was playing happily so I could make sure to get enough to eat during the day. I discovered Thai Kitchen brand instant rice noodles, and it fulfilled all the requirements I was looking for in a quick noodle meal. My favorite flavor of this brand is the Lemongrass and Chili. The ones that come in the bowls are fine, but I've found that the smaller, rectangular packages are usually cheaper and equally tasty. Another soup brand that I like is Kettle Cuisine. They make frozen gluten-free soups in single-serving bowls. I like that they feature flavors of soups that would normally contain flour (like cream soups and chowders). There is no sacrifice in flavor for the lack of gluten, and it tastes like comfort food to me! These soups are a great lunch option during the chilly months. I haven't delved much into GF breads so far, as I've found them in general to be dry, crumbly, and disappointing. As a result, I gave up sandwiches during my experiment (and I still haven't tried to go there). If I want to have a sandwich, I just have all the fixings together in a pile without the bread. It's not as easy to eat that way as, but I'm alright with that. However, if you have a good gluten-free bread recommendation, I'd love to hear it. I often eat leftover dinner foods for lunch, but those will have to wait until next week. See you then! 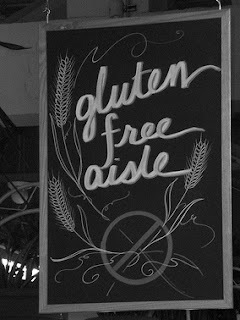 What a great article about gluten-free foods. I love Kettle Cuisine Soups. Thank-you for linking up with my Food and Health Carnival this week. I hope you will link up again. What about some type of potato bread? I was just browsing google for a recipe, and I see that some are extremely complex. But one simple one called for only potato, salt, butter, and gluten-free flour mix (preferably NOT potato). Haven't tried it myself though.